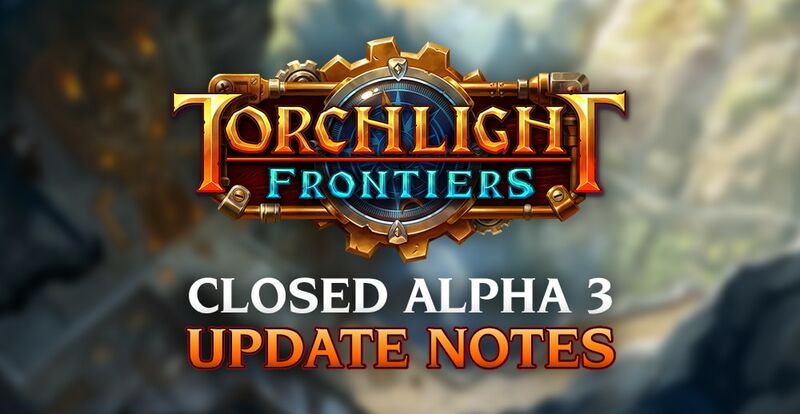 "Late last year, Closed Alpha 1 & 2 taught us a great deal about Torchlight Frontiers. Although it was only a couple days focused on server testing, players still gave us a ton of feedback about the game. We listened. We changed the designs. We made some big changes and a bunch of small tweaks. Fundamental systems for how a character progresses in the game have been significantly changed for Closed Alpha 3: characters have Frontier levels, harvested resources don’t impact skill progression and items got a massive tuning pass. Thank you to all of the testers who helped us out! The months between Closed Alpha 2 & 3 have given us an opportunity to respond to feedback, add new content, make new systems and squash hordes of bugs. Although this patch list describes a large chunk of changes, it actually represents a minor fraction of the work that we’ve been doing. We have big projects that we just aren’t ready to talk about. Closed Alpha 3 marks a massive transition for Torchlight Frontiers. We’ve lifted the NDA - streaming will happen. One last character wipe, and then no more character wipes - we really and truly aim for that to be true. The game will be up 24/7 from now on. Players can reach the far corners of the content instead of just the first couple areas. We are excited to have players living in the game and telling us about the awesome and the ugly. Alpha 3 begins our full journey together to make this into a great game. It’s going to be a fun ride. Thanks for joining us." The more we all share the Torchlight Frontiers experience the greater this game is going to be. See you online in all the best places! The entrance to Strongtusk’s lair can be located in Gobstomp Stronghold. You’ll navigate the Glimmering Grotto and Subterranean Trench before arriving at the Ceremonial Abyss. The Hyvid frontier now has five public hub areas. Each area has its own set of private dungeons and series of quests to investigate while driving back the skittering Hyvid masses. Infestation Incursion: An Imperial forward camp overrun by the Hyvid, this area has only been partially infested. Infested Forest: The full infestation has bloomed in this portion of the forest, bringing with it poisonous vents. Bogwood Hollow: Sizzling pools of poisonous muck fill these infested woods and canyons. Acrid Plains: The infestation thickens amid the toxic pools as we near the heart of the Hyvid colony. Players will no longer spend Skill Points to equip higher level gear. Killing monsters grants XP for the Frontier currently being played in - with an experience bar at the bottom of the HUD. The character’s Level for each Frontier is displayed in the Inventory Screen. Equipping an item requires the character to be that item level or higher, in the matching Frontier. Level cap is now 50. Alpha players can craft their first two Wardrobes for the low low price of 1 Gold in your Fort, as a thank you for playing this early version of the game. After this testing phase, the reduced price will not be available. Get ‘em while they last! Wardrobes provide additional gear storage, convenience, and fort decorating potential. Once a player acquires a Wardrobe, it can be placed in their fort like other buildable objects. Interact with a placed Wardrobe to store or swap gear. The Swap function replaces all gear on the Wardrobe with the matching slot on your current character. Gear stored on a Wardrobe updates the look of the Wardrobe for all to see. Waypoints are no longer single-bind. Once your character unlocks a Waypoint they will always be able to choose that destination when opening a travel portal. The Area Map screen has improved icons and layout for usability, and now lists the dungeons which are connected to each major public area. The player’s fort, the Imperial Outpost, and the player’s active portal are also selectable from the area map. [M] default keybind now opens the Frontier Map. [Tab] default keybind now opens the Area Map. Consumables can now be found in a dedicated inventory tab. Potions have their own sub-section in the Consumables inventory. A character can hold a max of four stacks of potions - one equipped and three in the Potions sub-section. Helm & Gloves: +% Gear Luck (improved chances of gear drops). Shoulder, Boots & Hatch: +% Gold Luck (improved chances of gold drops). Chest, Pants & Locomotion: +% Potion Luck (improved chances of potion drops). When your luck bonus is triggered you’ll see a “Lucky!” notification. Pets can now equip a Collar and two Pet Tag gear items. These items are acquired from loot drops. The starting Fort layout has been updated. There actually is one now! This level should now feel like a proper part of the game world. It’s a bit dingy after being uninhabited for so long. You’ll want to start crafting proper Structures, Natural pieces, and Odds n’ Ends to truly make the space your own. All the decorations found in the starting layout can be rearranged or placed into storage as players see fit. The Shared Stash is now a player controlled object as well. The portal area and Sgt. Klive are not currently moveable. Crafting recipes in the Fort Inventory have been updated to the intended starting experience. Many additional decor pieces, styles, and types will be added to the game in coming releases. The reward banner for Closed Alpha Test 1 & 2 will not be available at the start of Alpha 3, but don’t fret! We’ll make sure everyone entitled to one gets them in a future alpha update. Opposing Forces is no longer a Passive Skill and is now a default class mechanic for the Dusk Mage. Luminous Run re-designed to have a 6 second cooldown, a 2 second duration, and only gives a small speed boost. It should now fill the DM's need for an escape skill. Holy Fury damage increased from 150% weapon damage to 275% weapon damage and the mana cost is reduced from 5/s to 3/s. Additional ranks in Unlimited Power now increase damage but maintain a 30% increase in mana cost. Enhanced Servos bonus damage increased. Increased Forged Heat Ventilation by 200%. New Passive that adds damage to Rapid Fire per rank. Rapid Fire now begins with less delay. Forged now trigger a defensive buff when damaging an enemy with melee attacks. This gives better survivability to Forged who fight in melee combat. Relics give a player a cool superpower, but we’ve heard that they need to do more. They need to have such a big impact on character strategy and such an interesting journey that they feel like a subclass. To get them to be that important, we need to go back through the Relics and make them better - a few at a time. So, we’ve decided to reduce the number of Relics out there. Expect to see improvements to previous Relics before we add new ones. Relic weapon leveling curves adjusted so that leveling costs are flat after level 11. Many items with +% Relic duration affixes have had their bonus reduced. Forged can now equip staff and great weapon Relics. We made some big changes to items to address a wide range of issues. This was an effort to make items more strategic, fun at low levels and exciting to find. We were seeing magic, rare and legendary items dropping so often that they didn’t feel special. The legendary items were in about the right place, but it was far too common for players to always have a full set of rare items after level 3. So, we adjusted the drop rates of the various qualities. Weapons full of pure damage affixes and armor full of pure defensive affixes give no room for other interesting affixes. So, we’ve limited how much of each item’s affixes can directly push up the DPS and the armor. We also made a bunch more interesting affixes to spread around. Limited Health and Energy Regen affixes to a maximum of one per item. Chest pieces, Pants, and Forged Locomotion items can now drop with damage affixes. Great Weapons will no longer drop until at least level 10. Normal quality weapons that deal damage other than physical no longer drop until at least level 10. Slightly reduced the monster type specific secondary damage affixes. Health +% bonuses flattened across levels. Primary health percent affixes were removed and secondary affixes tuned accordingly. Changes arrived due to players getting health gains at each Frontier level. Block chance flattened across the game. Reduced the proc chance for Slow effect affixes. Greatly reduced the strength of Health on Kill and Health Regen affixes. Slow effect affixes no longer deal damage nor contribute to the DPS stat calculation. Potions no longer have level requirements. Health potions now heal 60% of health. Renamed the potion for the Hyvid Frontier from Poison Potion to Antidote Potion. Antidote Potion initially heals 25% health and then 10% per second for 5 seconds. Reduced potion costs from 100 gold to 75 Gold at shops. Increased number of wood resource nodes in Deadgob Falls. Renamed "Subterranean Tomb" to "Ceremonial Abyss”. Reduce the amount of monsters spawning in the Infested Forest just outside the Imperial Outpost. Increased the safe area around General Graye just outside of the Den of Upheaval, you're far less likely to be swarmed by monsters while talking to General Graye. Reduced monster spawn chance in Wood's Edge. Decreased the hit point bonus given to unique and legendary quality Champions. Significantly reduced the damage of Dog Jockey's charge attack. Do you enjoy getting one-shot? Nope, no one does. Behold, the mighty nerf stick! Decreased Krronk’s hit points and damage. Shooty is now a pale skin Goblin Blaster and has substantially increased hit points. Nugget is now a pale skin Goblin Gunner and has substantially increased hit points. Lazy Eye has substantially increased hit points. Olgarth’s overall damage has been reduced. Reduced Charger Juvenile health and slightly increased its damage. Reduced aggro radius of Cocooned Goblin. Reduced Champion Goblin Blaster's hit points. Increased Champion Goblin Lumberjack hit points. Goblin Hound and Goblin Rider hit points increased and loot quality improved. Goblin Engineer's fire attack now has a longer cooldown, now has a second melee attack, now has more health and does more damage. Goblin Rider hit points increased and its charge attack is now easier to see coming. Goblin Hound hit points and damage increased. Reduced the chance that a Mimic will appear. Mimic Chest health, speed, damage and item quality increased. Foul Hurlers spray poison less often but do more damage when they do. Reduced the pack size of Clumsy Zombies. Reduced Champion Brittle Skeletons damage. Skeleton Archer damage doubled, Champion damage increased, but they fire less often. Decreased the length of invulnerability for melee skeletons as they emerge from the ground. Doubled the duration of poison from Hyvid Fliers, Gliders, and Guardians but lowered the damage by nearly half. Added new UI elements to better communicate and celebrate Frontier and Relic level-ups. Added a new level-up effect that does AoE damage to surrounding monsters. Updated the look of Toxic Dart’s poison pool. Updated VFX for Goblin Miner candles. Currency drops now play different VFX when moving vs stationary. Added screen shake to player death sequence. Updated textures for Vespid Eggs. Adjusting video settings should now be friendlier and apply as expected. Audio detect for video settings have been adjusted and should be more reliable. DPI curve changed to make UI elements smaller on larger resolutions. Quest Tracker slightly adjusted further right. Phase Portals now trigger from the player's level in that area instead of their average item level. Level 1 Skill stations in your Fort no longer require wood or stone to craft. Added rubble and other decorations to ramps to make pathing clearer. Removed instances of pets delivering varying amounts of damage. Now all pets deal a single packet of damage, regardless of what the animation looks like. Swift-Footed passive now only triggers when killing monsters. Updated several instances of placeholder icon art. Made several improvements to areal and mini-map. Fort Props now rotate in 15 degree increments in edit mode. Area map can now be opened by pressing tab key. Confirmation step added before destroying items from the inventory. Improved layout and feedback for area and world map when using gamepad. Adjusted some size scales for items appearing on the ground. Increased the UI scale and pinned Inventory panels to the sides instead of the top. Adjusted the auto-pickup animation to be less swirly. Adjusted the Fort building widget to fill the right side to keep the box from feeling small with larger resolutions. Attempting to use a second Mapworks portal will now ask whether you want to replace the existing Mapworks portal. Monster corpses will now fade out once expired, instead of vanishing immediately. New time-of-day widget added to the mini-map UI for outdoor areas. Updated Vendors to display their own names, the Gold you have, and the Gold cost of items without the need to mouse over. Added Celestial Armor, legendary equipment for the Dusk Mage. Unique and Legendary Champion Goblins will now receive randomly generated names. Added more pre-generated pet names to choose from during character creation. The difference between player and monster levels is now part of damage calculations. Updated the default max Skill queue times from 0.4s to 0.25s making casting skills in quick succession feel more responsive. Reworded and changed the requirements to account for the new waypoint system. Relocated Sgt. Wilx to Wood’s Edge for "Way Back" quest. Made changes to the Steadfast Dead clicky to provide items for each task within “Dead Collection” quest. Added a Forged friendly quest reward for “Shadows Rise” quest. Reduced requirement to kill Champion Goblins from 20 to 8 for “Battlefield G” quest. Reduced the amount of fire armor required from 8 to 4 for “Muster Your Metal” quest. Goblin Weapon Racks now take a few hits to destroy for “Gob Boom Blast” quest. Updated to be a one-time account-level quest for “Striking Out” quest. Updated dialogue to be more in line with “Welcome to the Frontier” and changed the turn in to Yapper instead of General Graye for “Fueling the Fires” quest. Updated to be a one-time account-level quest for “Buff Up” quest. Increased the number of zombie pants and shirts required to complete, and also greatly increased the rate at which zombie pants and shirts drop in the Cave of Sorrows for “Caught Dead in Those Clothes” quest. Updated objectives to require Hyvid Workers instead of Hyvid Soldiers for “Hyvid Colony Infestation” quest. Updated requirement to include any Hyvid Champion instead of Champion Hyvid Fliers for “Sunken Forest Infestation” quest. Fixed an issue preventing Abandoned Supplies from dropping during the “Lost and Found” quest. Updated text to indicate who has Yapper’s Favorite Fork for “A Favor for Yapper” quest. Fixed several gamepad navigation issues in Vendor screens. Gold pickups no longer steal gamepad targeting while flying around the player. Removed errant + symbols from various skill descriptions. Fixed an issue with General Graye’s owl, it’s no longer levitating and is now secured to the perch. NPCs in town are no longer affected by AoE damage effects. The rifle on the stump in the Imperial Outpost no longer plays the item selection SFX. Fixed an issue causing the Dusk Mage Great Weapon attack VFX to be out of sync. Goblin Gunner's missile no longer stutters during travel. Goblin Lumberjack now has a run animation when feared. Boss names now consistently appear on their health bars. Corrected the level ranges for cocooned goblins. Fixed several Skill descriptions to correctly display costs and cooldowns. Fixed cases where pets could do double damage on a single attack. Goblin Bombers actually throw bombs and properly self-destructs now. Fixed Hardened Chest Armor dropping with only one secondary affix instead of two. Corrected rare shields that were getting additional primary defense affixes instead of a secondary defense affix. Fixed an issue preventing poison vents in Hyvid areas from doing damage. Fixed an issue preventing adds spawning in the Cave of Boom boss arena. Also updated the Firedancers to be pale skin goblins. Fixed an issue with Infernal and Putrid skeletons spawning in Dast's Lair. Fixed Snotskin Village and Gobstomp Stronghold spawning only Undead at night. Corrected an issue with levels for items that drop from gadgets in the Hyvid Frontier. Corrected the level range of the Foetid Forest in the Hyvid Frontier. Fixed it so Earth Ember Deposits, Flint and other inappropriate harvesting nodes do not spawn in the Murky Cavern dungeon. Corrected the display text for the Immobilize affix. Fixed an audio issue for Zombie Shirt and Pant quest items. Fixed an issue preventing credit when destroying siege weapons for “It’s Sabotage” quest. Corrected requirements to specify Goblin Blaster instead of Goblin Gunner for “Best Frenemies” quest. Fixed typos in dialogue for “Message Intercepted” quest. Fixed missing NPC dialogue for “Bugswat Password” quest. Fixed an issue preventing the Fort portal from appearing for “Fortuitous Arrival” quest. Adjusted the spawn for Bowls of Questionable Stew so that they don't land inside the cauldron for the “Bad Medicine” quest. Fixed an issue preventing chests spawning in Hyvid caves. Fixed an issue causing a crash when a Hyvid Egg Pod hatches into a Larva. Fixed an issue causing a crash when Vespid Larva evolves. Fixed an issue with Cocooned Goblins causing a crash. Fixed an issue with the Infested Forest causing a crash. Fixed an issue causing a removal of basic attack animations when switching Relic weapons. Fixed an issue preventing potions and scrolls from using their drop animations. Fixed an issue that caused a crash when shattering frozen monsters. Fixed craft sounds in Fort stations and Fort edit mode. Fixed several Fort prop previews being the wrong size: crafting stations, skill stations, Wardrobes and the Mapworks device. Fixed an issue preventing characters from appearing correctly during character select. Fixed an issue preventing the ability to claim crafted Relic weapons. Fixed an issue with destroying items when attempting to use an Identify Scroll. Fixed an issue preventing Identify Scrolls from being consumed after use. Fixed an issue preventing lock icons on unlearned skills from properly displaying. Fixed an issue preventing pets from running away after losing all their health. Fixed an issue causing items in the consumables inventory to disappear. Fixed an issue causing Dusk Mage Foci from flying in from off frame after harvesting. Updated text from “No Inventory Space” to “Cannot Equip. Frontier Level is Too Low.” when trying to equip gear above your current Frontier level. Fixed an issue that prevented players from entering Phase Beast portals. Fixed an issue causing Skills to display incorrectly in the Skills Menu. Fixed an issue that prevented celebratory VFX during Relic weapon level up. Players are no longer able to rapidly click boss chests for multiple sets of loot. Closed a loophole that allowed players to grant themselves free stuff. Fixed issues preventing equip/unequip functions in the Reliquary. Fixed a bug getting players stuck when hitting Tab twice. Fixed an issue that caused a crash when attempting to use Holy Fury. Fixed an issue preventing currency pickup VFX from playing. Fixed an issue causing Chilled monsters to slide instead of playing their walk animation. Relic weapons should no longer vanish when attempting to drag and drop. Buying a potion with a full potion inventory will now refund the Gold spent. Fixed an issue that prevented the Potions inventory from being saved. Fixed an issue that prevented players from filling Potion inventory stacks if they had Potions in every item slot in that inventory. Fixed an issue that prevented the Potions inventory list from being updated on the vendor screen when buying potions. Fixed issues preventing the quest tracker from showing completion for the correct quest. Fixed an issue causing the Relic weapon storage to load items from the account stash instead. Fixed an issue that caused the “Place” button to also purchase another Fort prop. Fixed an issue preventing crafting costs not displaying in the crafting UI. Fixed an issue causing Gold costs to display twice on crafting recipes. Fixed a crash when talking to certain NPCs in the Imperial Outpost. Fixed an issue causing breakables to be out of range of melee attacks. Fixed issue with quests not appearing in the tracker after completing "Fortuitous Arrival". Fixed a crash when players were killed by monsters summoned by Hyvid Egg Pods. Fixed Portal issues while in Wideload boss arena. Fixed a problem doing the "Caught Dead In Those Clothes" quest that would remove your armor. Fixed an issue preventing boss health from properly displaying. Fixed an issue causing characters to appear to be moving in only one direction after using Skill stations. Fixed an issue that destroyed items when moving them to the shared Fort stash if it was full. Fixed an issue preventing basic attack animations from appearing to other players. Fixed an issue preventing Spirit Well’s animation from completing. Fixed issues preventing proc effects like Bleed, Chill, etc. from working after loading a character. Fixed an issue causing Chat text size to appear very small. Fixed an issue preventing skin color selection from appearing to other players. Fixed an issue preventing the sale of individual Potions from a stack. Detailed change log for Update 5, coming April 23rd. Learn everything there is to know about the Railmaster, the latest hero to join our ranks on the Frontier. New Beginnings is the first major update since we made Torchlight Frontiers a 24/7 game.